During 2018, OptiFreeze has focused on commercializing of our technology, sales and customer trials on the defined focus segments “OptiDry” and “OptiFlower”. Marketing and sales activities has intensified. Our first commercial processing line “OptiCept” is sold to a leading multinational company in flower industry. It has been a year for us to establish solid and confident steps towards focused markets where we have seen the great potential for our technology. OptiFreeze has conducted several customer trials during 2018 on two defined focus segments OptiDry and OptiFlower. OptiFreeze has gained a vast experience from the trials that prospered us in understanding customer needs and requirements of industrial scale production. Our customers have contributed in financing the trials which brings a serious approach in taking steps towards sales. The sales process for OptiFlower segment was faster than any other segments for several reasons. The first reason is that our technology is needed in flower industry to increase the sustainability and to develop our customer’s businesses. This means that it is not only “nice to have” technology, it is necessary to implement our technology in the flower industry. Second reason is the multiple benefits of OptiFreeze technology. Plant materials (cuttings in particular) can have longer life time, they show better and faster growing performance, their quality is significantly increased even after long storage, increased quality gives a big competitive advantage at the moment of sales of plants to growers and many other potential applications of our technology on different products (cut flowers, other types of plant cuttings, etc.) in future. 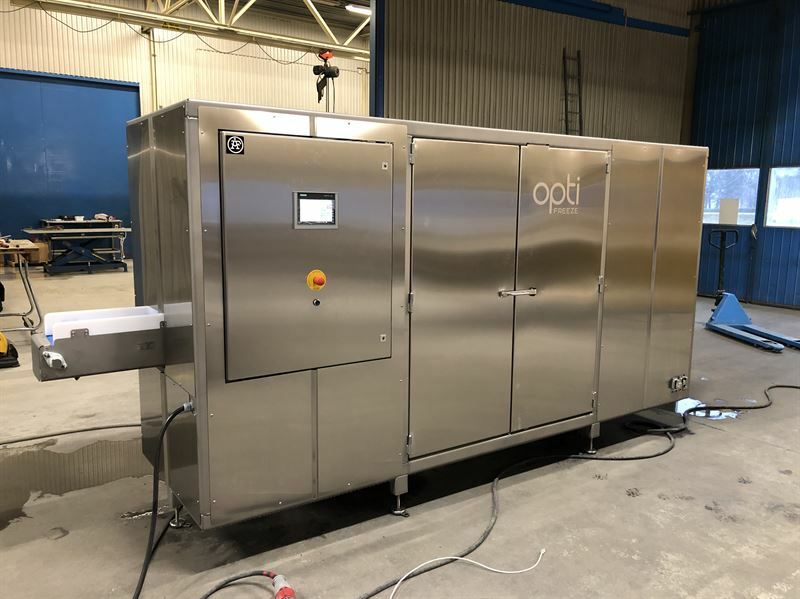 The first half of the year, we focused on producing a new chamber for our OptiCept system that is larger in capacity especially for products (herbs, fruits and vegetables) that are meant to be dried. During the customer trials, we had opportunity to test our system at customer’s site online and offline. This period of trials now gives us the possibility of having a product for sales on this segment. We have observed that many parts of our system are in line with industrial level and we could determine the parts that require changes to adapt our system at industrial standards. OptiFreeze has received the first order of the product OptiCeptTM for a customer at OptiFlower segment in September 2018. We have been fully focusing on this delivery which is taking place at the end of January 2019. Here is a picture from the production of our treatment chamber. 2019 starts with an exciting trip to Kenya for OptiFreeze. Our R&D manager Katarzyna Dymek and I are travelling to Kenya on the 3rd week of January together with our customer to visit their farm in Kenya. The aim is to understand the working environment and plan upcoming months together with our customer. We have been working on a collaboration agreement with the same customer, where the current aim is to finalize in the beginning of 2019. Following the delivery of OptiCept system to Kenya, we will install and educate our customer on how to use the system. The aim for the next year is that OptiFreeze supports the customer with our know-how, aiming to treat different flower cutting species over 2019. Next year, our focus will be again on OptiFlower and OptiDry segment where our aim is to sell more OptiCept lines to current and potential customers. We also want to establish more customer contacts in all segments and start the process of sales for food industry. OptiFreeze team is excited and fully focused in line with our plans for 2019. Having said all, I wish you all a Merry Christmas and a Happy New Year!